Over the decade that I worked with struggling readers, I found myself relying heavily upon a few excellent books, or book series, in the process. The OnTrack Reading Phonics Program progresses quite rapidly, especially if a child was in need of vision therapy and had completed it. The typical child would go through the entire Advanced Code Workbook in 18 to 24 hours of instruction, plus an equivalent amount of time spent at home doing homework exercises. The Ontrack Reading Advanced Code Phonics Workbook itself contains several short stories written using only code that has already been covered in the curriculum to that point. These stories are anything but fine literature, but serve the purpose of giving a child practice at decoding words that he's been prepared to decode up to that point. However, both of the reading methods I studied while developing the OnTrack Reading Phonics Program put an emphasis on reading good children's literature, rather than decodable books. I found that the brief exposure to decodable stories in the Advanced Code Workbook usually provided sufficient practice at decoding and would then quickly move a child into books written by acclaimed authors of children's literature. Five engaging and amusing stories written at a level that a child beginning to learn the advanced code will find challenging, but rewarding, to read. Many of the children I worked with, even though 3rd or 4th graders, started with very poor reading skills and little knowledge of the advanced code. 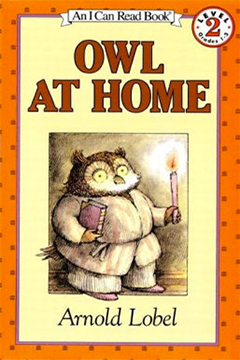 The book that fit that group well was Owl at Home written by Arnold Lobel, written at a 1st to early 2nd grade level. Mr. Lobel wrote several excellent children's books at about the same level and Owl at Home was one of the best, in my opinion. A client of mine would typically read one of the five short stories each session for five sessions and then we would move on to the next level. Each of the stories is humorous, playing on the fact that this particular owl was not of the wise variety. Seven short stories written at about the same level as Owl at Home provide additional practice at an easy level. A child who liked Lobel would find that his book Mouse Tales is written at a similar level, and could then move on to Lobel's Frog and Toad books where the stories are written at an easy level, but are significantly longer. At the next level I would pull out the first book in the Henry and Mudge series, titled appropriately, Henry and Mudge: The First Book. If a child liked it, he could then go on to read several of the other books in the series on his own time. The text is just a bit harder than Owl at Home and consists of one long story broken into several short chapters, as opposed to separate stories in Owl at Home. Henry and his dog, Mudge, share experiences spread over several short chapters in the first book of this series. Arthur envies his pen pal until he suddenly realizes that he has it pretty good himself. After finishing Henry and Mudge, we would move up to something on the order of Lillian Hoban's Arthur books, such as Arthur's Pen Pal or Arthur's Loose Tooth. These are books of about 60 pages, each page half illustration, with no chapter breaks. Once clients of mine had progressed to the point where they had finished one of the Arthur books, I would usually start them on the Magic Tree House series, again using the first book in the series, Magic Tree House: Dinosaurs Before Dark, so that they would become familiar with the magic tree house upon which the series is based. This series has become very large, and the reading level is sufficiently high that a child caught up in the stories will get a great deal of exposure to print while going through it. At this level, there are literally thousands of good books that a child might choose instead. The first four books of the Magic Tree House series that includes 45 stories as of January 2011 appeals to both boys and girls. After a child is capable of reading the Magic Tree House series, the whole vista of children's literature effectively opens up. A relatively new entrant on the scene is Lemony Snicket's A Series of Unfortunate Events, of which The Bad Beginning is book #1 in the series. The main characters are a 14-year old girl and a 12-year old boy, a good indication of the sort of child who will find them interesting, though I had an older client who read through A Bad Beginning in one week, her first success at reading a complete book without being told to do so. The three Baudelaire children, 14-year-old Violet, 12-year-old Klaus and infant Sunny, must be resourceful from the outset when they find themselves suddenly orphaned. Maniac, orphaned young and on his own, influences his adopted town in unexpected ways, all of them beneficial. With an older boy, perhaps 5th to 8th grade, I would often pull Maniac Magee by Jerry Spinelli off the bookshelf in my office. It's an excellent book for an adult to work with because it's such an interesting read, with an excellent message throughout. And then there are the now-classic Harry Potter books, seven in all, written so that a child reading one book a year from 6th grade on will have the characters age right along with him or her. That was part of the genius of the Harry Potter series. It appealed to hundreds of thousands of kids at a young age and then the characters grew up right along with them as author J. K. Rowling managed to write a new book in the series at approximately one year intervals. There are thousands of excellent books for children of all ages out there. The above are a few that I used regularly in my reading business over the years.